When we hear “Do you understand?” it’s a clear sign that someone might think that more information and education alone will change another person’s mind. If the answer is “yes,” one then assumes the person will do or think whatever was explained. That’s an education bias: the belief that one can change people’s behaviors and thinking through more education. The marketer’s goal is to help customers feel confident about their choice. Just providing more information doesn’t help. That means tapping into the emotional side. Tapping the thinking side alone won’t do it. Yes, it might seem obvious. People forget though. For instance, citing “knowledge is power” often goes along with more information. Is some ways, more information and education can make things worse. Too much of both can affect thinking. Moreover, as the articles “Too Much Information” and “You Choose – The Tyranny of Choice” show, they can shut it down. They render people powerless to make decisions. It’s why Tony Hey in his article, “The Big Idea: The Next Scientific Revolution“ declares that the processing of information is the next scientific revolution. Too much information exists. It’s too hard to sort through it all. It overwhelms people. Overcoming the bias to dump more information and push more education on people means remembering to tap their emotions. It’s not just about whether they understand. It’s about how they feel about their decisions or changes. Change is a very relational process. Often if people just like or trust the promoter of change, no rationale is needed. Conversely, no amount of information and education can overcome a soured relationship. The secret to change is relationships. That taps the emotional side of people. 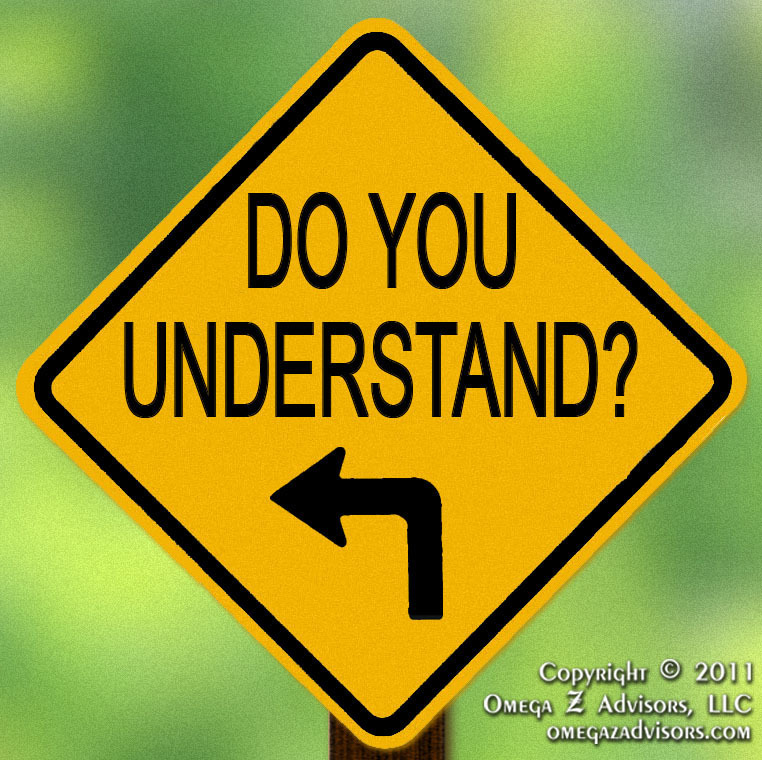 (1) When we ask “Do you understand?” after a lesson, it is unlikely that we’ll learn much. Most will say yes to minimize further involvement, especially if they don’t understand. If we want to really know, ask good questions about the material or have each student do a one-minute paper. You provide a good addition to the understanding of this question, John. My intention was to show how often we use it in reprimands or in securing supportive action. The implied assumption behind the question in this context is that I’ve supplied the missing information that you lacked so now that you have all the facts you must agree this is the right course of action (if you understand you must agree). Nonetheless, your thoughts also indicate that not only will a positive answer minimize further involvement but it will minimize potential disagreement and conflict from a negative response. I like your second thought. It encourages engagement which is a form of doing. People learn more by doing than by simply listening. In regards to Einstein’s quote, let’s remember it concerns concepts, not application of those concepts. Conceptually, we can easily explain a rocket launch; however, it’s not so easy explaining all the steps and details necessary to make a successful one. Too often I’ve seen this quote used to justify simple, mediocre solutions versus complex, effective ones.